The true goal of this blog is to keep our loved ones up to date on everything that is going on in our lives. We have so many people that we love in different parts of the world, and we can’t always regularly communicate what is going on because we don’t see you all nearly enough! I’ve decided to share a little bullet point list of things that I have shared with people who I have been able to catch up with – just a glimpse of the things that are happening and what we are learning! Ever since we got back to Spokane at the beginning of July I was getting pretty sick every few weeks. This sickness (abdominal pain and vomiting) would cause me to have to miss work every now and then. Unfortunately that caused me to have to find a new nannying job. So toward the end of October, I began nannying for a new family. I could clearly see God’s hand in this situation because as soon as I changed jobs, my sickness went away! Praise God! I see this as Him clearly leading me to a new family to get to know – while still being able to be on great terms with the previous family I nannied for. I am enjoying nannying a lot – and I truly love all of the families I have gotten to know! It is great experience and a wonderful way to get to know some great people and become part of their family in a small way! This job change brought a time where we truly had to trust God as our provider. He truly does provide! He has provided for us in more ways than I could share. I am amazed by how good He is to us! Joe and I have been getting to know some great families from our church. They have truly become our Spokane family! We have felt loved and provided for in many ways. We have been learning so much from these families just as we see them in their every day life and hear about marriage and having a family! We have felt encouraged to give more freely and love people selflessly. We have had a few visits from friends and family this semester! First, our friends from when we worked at SpringHill camps, Mark and Emily, came to visit! We had so much fun showing them around Spokane and Coeur d’Alene. Mid-October Joe’s parents (and mine now too!) came out to visit. We stayed at a beautiful house on Hayden Lake in Idaho for the weekend. Joe’s mom ran her 80th marathon! We spent the weekend canoeing, kayaking, paddle boarding, sitting by the fire, and we had a few friends come out too! And then last weekend my mom and grandma came to visit! We had a lot of fun eating, shopping, touring around beautiful places, and spending quality time catching up. I am finishing my very last class online right now. It is my Biblical Studies Capstone course – and it is due December 15th. After that, I am officially done with all of my college coursework at Moody! Joe is finishing up his last few weeks of classes for the semester before finals. His favorite class this semester is Romans. He is learning a lot – and I love hearing all of the practical things he is learning that we are able to apply to our lives! He just has next semester at Moody before he is finished with his undergrad. We will be back in Michigan December 12th – January 4th for Christmas! We can’t wait to see everybody and spend time with family and friends. We will both be walking in graduation at Moody-Spokane on May 23rd. And some more exciting news: Our plan right now is to move back to Michigan this summer! We feel that that is truly where God is leading us for this next season of our lives. We are going to be living with my grandpa (where we got married) and we look forward to spending time with him and saving some money in the process! Our tentative plan is to move back after our friends’ wedding in July. But we’ll see! So for those of you who haven’t heard from us – that is a small (but not so small) update! If you ever want to talk, please call, email, text, or Facebook message us. We love to talk – especially me, as Joe has definitely noticed that I never really stop talking or sharing every thought. We’re thankful for all of the love, support, and encouragement that we continue to receive from many of you. We feel so blessed by the people we get to do life with! 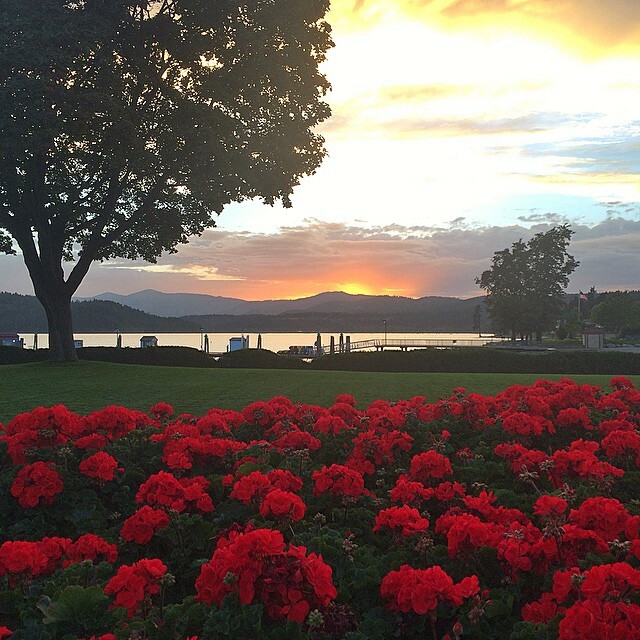 A sunset in Coeur d’Alene, Idaho while Mark and Emily were visiting. These moments are why we love living out west!